Over 150 years of existence have been more than enough to position Singer as one of the most trusted sewing machines manufacturers. Their vintage models are scattered across the world in our grandmas’ sewing cabinets. And they aren’t just beautiful – most of them are still in use and will probably be for many more decades to come. However, there’s much more to Singer than just those heavy metal beauties. They are an innovative company that keeps improving and building top-notch models for modern craftspeople. Singer 8500Q Sewing & Quilting Machine is one of the models that many sewists and especially quilters have come to consider. A single glance will tell you that it’s a computerized, state-of-the-art workhorse with tons of bells and whistles, and then some. Let’s look at its features, consider what it can and cannot do, and then we will come to a conclusion if it’s worth investing in. 8 Final Verdict – Is It a Good Machine? A total of 215 built-in stitches should give you more than you would wish for. There are nine essential, six stretch, 17 quilting, 176 decorative, and six buttonhole stitches. But it isn’t all there is – you can also combine different stitch patterns to create unique stitch sequences. The ones you like can be saved and reused later. A nice chance to remember how powerful computerized machines can be. You can select your stitches with two dials and LCD screen that shows you the stitch number, image, width and length. The model is widely known as Modern Quilter, and that is an absolutely appropriate title. 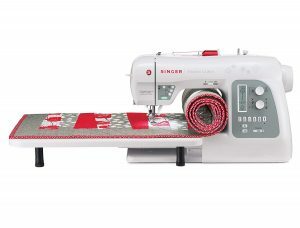 Indeed, this machine seems to be a dream come true for every serious quilter. First, it has a long arm design and an extra large extension table for extra 25 inches of sewing space. So, you should be quite comfortable when working with large quilting projects. Second, it comes with an extra high knee lifter, of whose value every quilter is well aware when it comes to hands-free pivoting. Bonus quilting accessories include darning and freehand embroidery foot, walking foot, quarter inch foot, and open-toe foot. Plus, you’ll get a quilting guide. Quilters will also appreciate extra large circular stitch capability that lets them stitch precise circles 10-15 inches in diameter – whether you want to appliqué them or make your own. And of course, there is a drop feed option, so you can do free motion quilting hassle-free. As much as I admire oldschool sewists who prefer to do everything manually and not lose control for a second, I have fell in love with automation within the past few years. This powerful machine has automatic needle threader which will save tons of effort. All you need to do is guide the thread from the spool to the needle by a groove and press the threading lever, and that’s it. No guesswork, no strain for the eyes, no trial and error. The bobbin winding is also automatic. Another thing I adore about it is that the machine will automatically stop sewing when you’re low on bobbin thread. Just quickly rewind it and continue where you left off! Plus, you don’t need to worry about presser foot pressure when sewing with fabrics different in weight and thickness. The machine will do it for you, adjusting the pressure – you guessed it – automatically. There’s also a possibility to program your needle to stay in the up or down position when you finish sewing for the day, so that you easily pick up where you left off without losing your stitch. And you can even remove your hands completely and watch the machine sew on its own with the electronic autopilot mode. Needless to say, you should only do that with very large projects. And that isn’t all you’ll get in terms of automation. There is also an automatic thread trimmer, automatic stitch length and width, as well as an automatic twin needle mode. 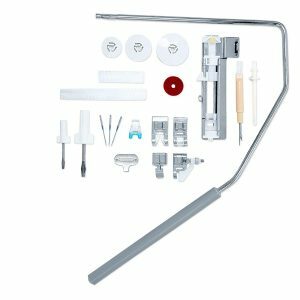 I nearly forgot to mention – apart from the specialty quilting feet that I enlisted above, you will also get an all-purpose foot, a zipper foot, a buttonhole foot with underplate, blind hem, satin stitch, and button sewing foot. That’s a nice selection that should get you covered with whatever projects you may tackle with Singer 8500Q machine. The 7-point feeding system adds to the machine’s versatility, so you don’t need to worry if it will feed delicate fabrics nicely. Also, the stitching speed is adjustable, reducing frustration while tackling trickier areas. And if you’re a night owl, the six LED lights will illuminate your working area just enough. An excellent quilting machine. Free motion quilting is a breeze, and there are lots of other features that will make quilting an even more pleasant and productive experience. The extension table is large enough to accommodate even the bulkiest of projects. Plus, there’s a wide variety of specialty feet that quilters would have had to buy separately if they didn’t come included in the package. Heavy-duty metal frame accounts for its sturdiness and stability, so you won’t have to sweat over fixing skipped stitches. Of course, that also means it’s quite heavy as far as portable machines go. With 37.6 pounds, it’s still light enough that you can move it around the house. Many great automatic options. Sure, it may take some time to get accustomed to them. But once you do that, you will wonder how you could ever live without them. So many things work at a touch of a button. A very nice selection of stitches. To be frank, many sewists I know (including myself) don’t really need that many stitches. But it never hurts to have more room to grow your sewing skills. The learning curve can be a bit steep, especially for inexperienced sewists or the ones who have never had a computerized machine. Even though a lot of features are automatic, you will likely need some time to adjust and figure out what’s what. It’s on the pricier side. Normally, I wouldn’t count this as a disadvantage. But hey – all of us have to think about keeping our budget healthy. If you covet for all the advanced features of this model, keep your eyes peeled for sales or consider getting a used machine. Some customers are complaining that the automatic threading and/or bobbin winding doesn’t work as promised. For the sake of complete fairness, I would add that others find the features fascinating. The recommended voltage makes it very exclusive. You should only use it at 110 volts. That means that you shouldn’t even consider it if you live anywhere other than the US or Canada. Even if you use a transformer, your warranty won’t cover any damage the voltage might cause. Final Verdict – Is It a Good Machine? For those of you who live in the US or Canada, this is an excellent, feature-rich and powerful workhorse. Even though it’s primarily advertised as a quilting machine, it’s equally good at sewing or doing various home decor projects. True enough, it comes at a hefty price, but I would say that it’s completely worth every penny. If I were looking for a new machine, this model would certainly make it to my shortlist without a second thought. The fact that it’s not a very popular choice is, I think, due to the price. However, if you can’t afford this machine or just don’t think that splurging on it is advisable right now, you can always opt for one of the cheaper models – Brother XR3374 is the first one that comes to mind. SINGER SEWING MACHINE: The 215 built-in stitches including basic, stretch, decorative, and buttonhole stitches allow you to sew a variety of projects, such as fashions, home décor, quilts, crafts, and more! 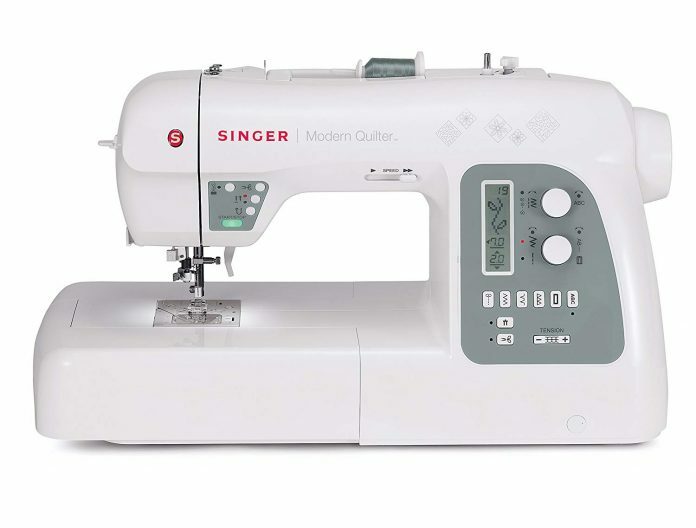 WARRANTY: The SINGER MODERN QUILTER 8500Q Sewing Machine provides 25-year limited warranty including 25 years on head, five years on motor and electronic components, and one year on belts, bulbs, and attachments.